Vegan Dog Food: Is It Healthy To Feed My Small Dog A Meat-Free Diet? Veganism and the trend of going ‘meat-free’ is at an all-time high. Interestingly, there has been a staggering 600% increase in people identifying as vegans in the U.S in the last three years - and it’s a similar story around the rest of the world. In the UK, the number of people identifying as vegans has shot up by a whopping 350% in the last 10 years, and “Veganism” was a top search trend in Canada in 2017¹. It’s no surprise therefore that we’re seeing the vegan and meat-free revolution spill into the pet food world, with a huge rise in the availability of both vegetarian and vegan dog foods on the market. But is it healthy to feed a small dog a meat-free diet? Owners of small or toy breeds know that, despite their size, many small dogs require more calories per pound than their larger canine peers. Ensuring your pet gets proper nutrition can therefore be especially challenging for owners who want to feed their little canine companions a meat-free diet. Fortunately, if you are vegetarian or vegan and would like your four-legged friend to share your meatless lifestyle – it’s still possible for them to get all the nutrition they need. 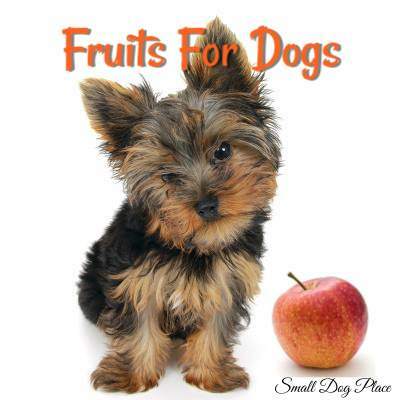 Dogs are omnivores, so they are able to eat a meat-free diet and thrive. 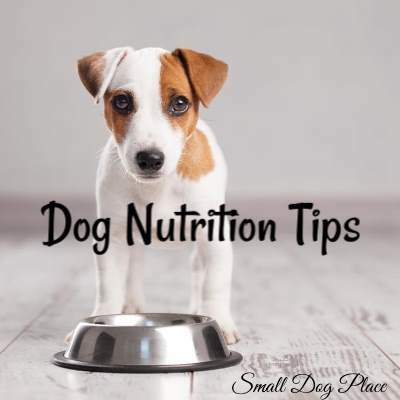 As a general rule, dogs require a wide range of nutrients, vitamins and minerals to stay healthy, so it makes sense that they consume a wide range of foods to get them. As an omnivore and scavenger by nature, your pet is adept at eating a variety of food and converting it into the building blocks of a healthy body. This is good news for owners who want to feed their dogs a meat-free diet, as the canine body is able to transform certain amino acids — the building blocks of proteins — into others, meaning Fido can get adequate nutrition even without eating meat. In fact, skipping chicken and beef can be highly beneficial for dogs that suffer from certain food allergies. When switching to meat-free pet food, there are a few nutritional needs you should be aware of. Our companions process food differently than we do, so your dog will need to get vitamin D from his food — not the sun, like humans — for example. Deficiencies in other vitamins and minerals such as B vitamins, calcium, phosphorus and iron that are obtained through eating animal products. If these deficiencies are not addressed, they can lead to serious medical issues down the road, such as reproductive or growth failure. Is a meat-free diet healthy for puppies or breeding dogs? It’s best to avoid feeding puppies or breeding dogs a vegetarian diet, as this helps thwart potential complications that can arise from these deficiencies. This is especially true for small or toy breed puppies, who can suffer from hypoglycemia, or low blood sugar, due to their faster metabolisms and low sugar and body fat reserves. You should also schedule at least two wellness exams with your vet each year to ensure your pet is prospering on a meat-free diet and is as healthy as possible. What is the Difference Between Vegan Dog Food and a Vegetarian Diet for Dogs? 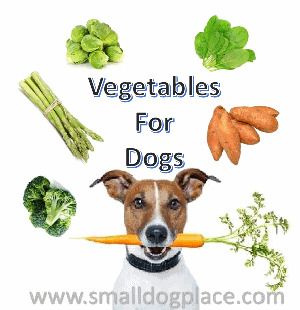 A vegetarian dog diet contains no meat, fish or poultry. A Vegan dog food diet contains no meat, fish, or poultry but also removes all animal products such as eggs, dairy, or honey. Vegan dog food diets rely entirely on plant proteins such as peas, barley, oats, potatoes, brown rice, lentils, flaxseed and other healthy plant protein sources. Some foods contain organic sourced ingredients but not all. Some less expensive vegan dog foods will also make use of ingredients such as corn, wheat, soy and gluten which may cause allergies in some dogs. What pet foods should you buy? 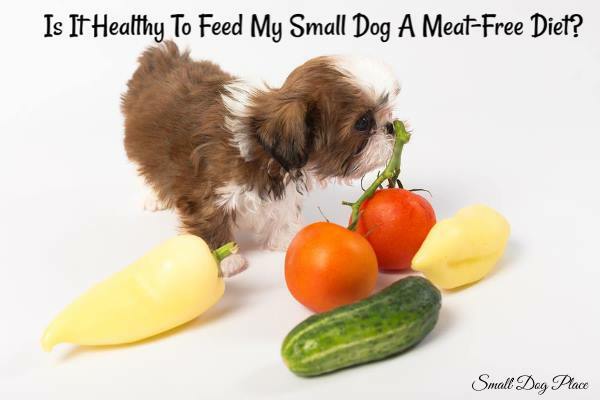 As with any diet, switching your small dog to eat meat-free requires buying only commercial pet foods that have undergone feeding trials and meet Association of American Feed Control Officials standards. This is critical, as a 2015 study published in the Journal of the American Veterinary Medical Association found that one-quarter of pet foods on the market did not contain all of the nutrients pets need. Small dogs also require smaller kibbles, so you should look for pet food designed specifically for your pet. If you plan on making your own vegetarian or vegan pet food, you must consult with a veterinary nutritionist to ensure your pet gets all of the nutrients they need. While replacing meat with eggs and dairy is a relatively easy switch, owners wishing to feed their dogs a vegan diet — one fully free from animal products — can still ensure their four-legged friend is getting the fuel they need with a careful balance of plant-based proteins such as beans, corn, soy and whole grains, under a nutritionist’s guidance. After reading the labels and ensuring your dog’s new diet will keep them healthy and fit, the only challenge is convincing them to try the new food! If your dog is a picky eater, try mixing their new, meat-free kibble with their regular food at increasing intervals to ease them into their vegetarian lifestyle. Are There Ingredients in Vegan Dog Food That I should avoid? Organic peas, organic barley, organic oats, lentils, organic sunflower oil (preserved with mixed tocopherols), potatoes, quinoa, organic flaxseed, primary dried yeast, calcium carbonate, natural vegetable flavouring, blueberries, cranberries, carrots, choline chloride, salt, dicalcium phosphate, potassium chloride, vitamins (vitamin A supplement, vitamin D2 supplement, vitamin E supplement, niacin, L-ascorbyl-2-polyphosphate (a source of vitamin C), d-calcium pantothenate, thiamine mononitrate, riboflavin, pyridoxine hydrochloride, folic acid, biotin, vitamin B12 supplement), minerals (zinc proteinate, iron proteinate, copper proteinate, manganese proteinate, calcium iodate, selenium yeast), taurine, DL-methionine, L-lysine, dried rosemary. PetBucket is an online retailer offering free worldwide shipping, stocking discount pet vitamins and supplements, as well as affordable tick and flea treatment for dogs, heartworm treatment, and treatment for intestinal worming. PetBucket stock famous brands, including Nexgard, Bravecto chews and topical treatments, Advantage multi, plus many more. Visit their website to shop these products, or check out their blog for information and advice on how to keep your canine companion or feline friend as healthy and happy as possible. In the UK, the number of people identifying as vegans has increased by 350%, compared to a decade ago, according to research commissioned by the Vegan Society in partnership with Vegan Life magazine. Veganism was a top search trend in Canada in 2017. And the preliminary draft of Canada’s new Food Guide, released in 2017 by the Canadian government, favors plant-based foods.